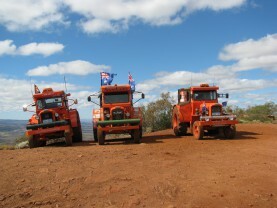 Three Chamberlain 9G tractors all towing caravans, recently returned from a three week trek exploring the Pilbara regions of WA. We were Maree and Brian Carr (Footloose), Vicki and Max Smith (Big Max) and Sandra and Trevor Snook (Snookums) and we headed off in early July, travelling north in the rain for the first four days, through Payne’s Find, Meekatharra, Kumarina and Newman. The countryside was wet and green and most of the inland roads had been closed due to flooding. In fact throughout the trip, all the major rivers and crossings were full and the cattle, sheep and crops were looking really good. 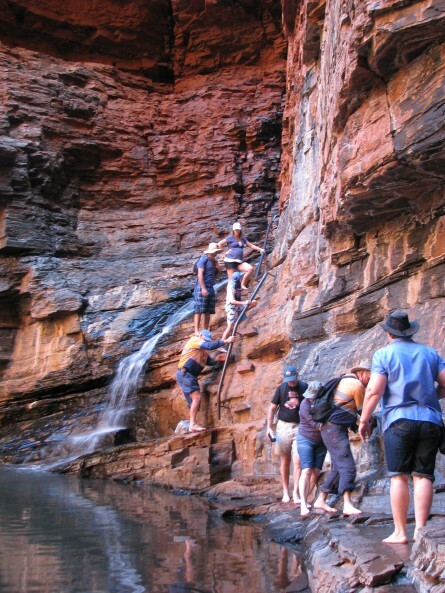 With so much water around, the presence of Murray Valley Encephalitis (mosquito virus) throughout the Pilbara Regions needed to be taken into consideration, especially when camping out at night. It was a welcome to finally feel the sun’s warmth and leave the rain behind us, as we made our way from Newman into Karijini National Park. As with all tourist destinations, especially at this time of year, the camping ground was full, so we were directed to the overflow area (just like the 2002 trek) where we set up camp. 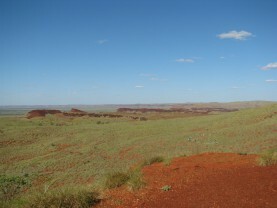 There was a water tank available at the site where Brian and Max caught sight of the local dingo. 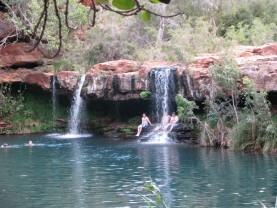 The gorges of Karijini were impressive. They were full of water and flowing. Dale Gorge proved a popular swimming spot and we enjoyed the 2 hour walk path to the various pools, including Fortescue Falls and Circular and Fern Pools. Luckily we emerged from the gorge just on sunset and just about the same time we were all starting to eye off what was left of Trevor’s packet of biscuits. We travelled on the quite rough and corrugated roads out to Joffre and Knox Gorges the following morning, then (with caravans unhooked) to Weano, Hancock and finally Handrail Gorge, which proved to be the most challenging with its slippery and somewhat treacherous descent. 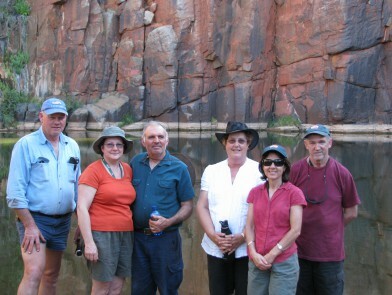 Unfortunately Hamersley Gorge was closed for repairs. On to Tom Price, where the tractors made a slow, and steady ascent to the top of Mt Nameless, the highest mountain in WA. Well worth the effort to capture the views from the top. 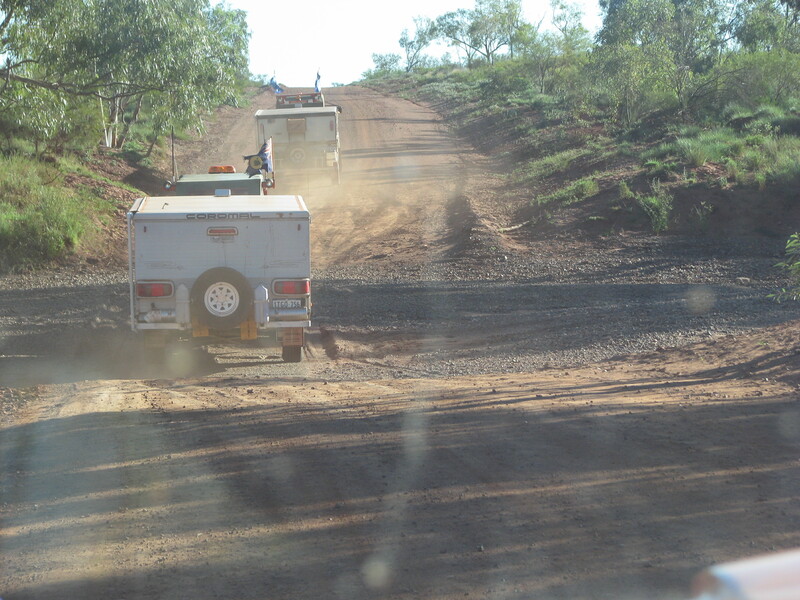 In Tom Price we obtained a special permit to travel on the Rio Tinto Rail Access Roadthrough to Millstream. 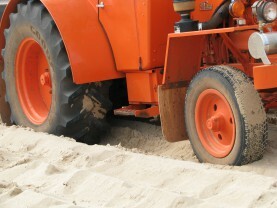 The road had just been recently graded and was in good condition. Not the same could be said of the Wittenoom-Karratha Roadthough, unbelievably rough in some parts with major potholes sometimes impossible to dodge! 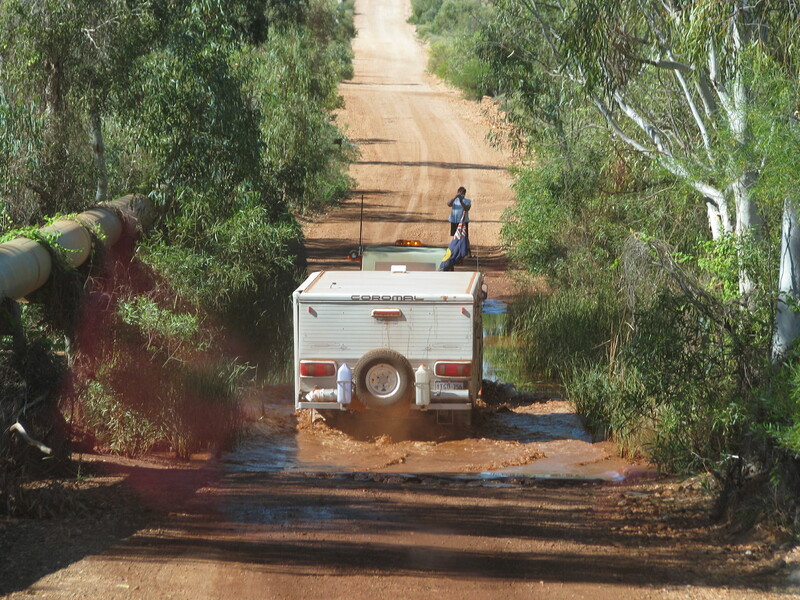 In fairness, the flooding throughout the Pilbara Region had taken its toll on many of the well-travelled gravel roads. 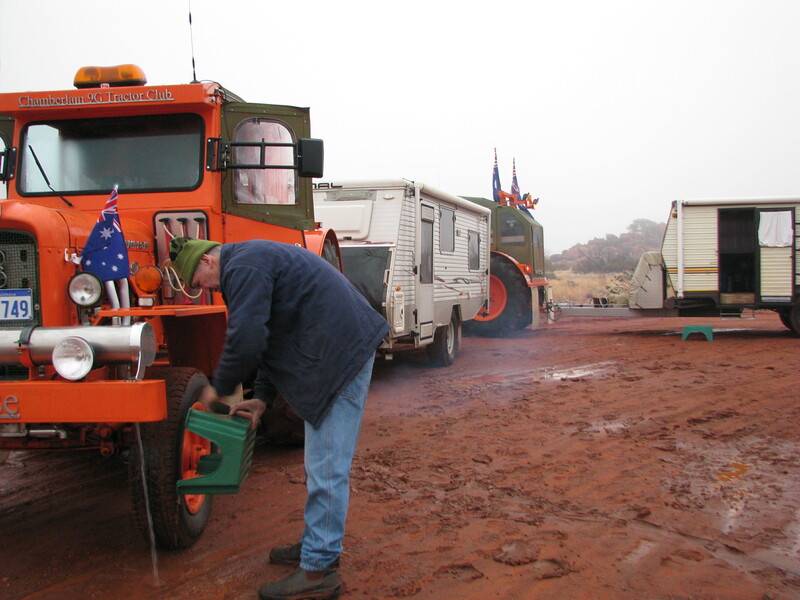 We camped by the roadside that night and enjoyed the company of many a 2 kilometre long iron ore train passing in the night. 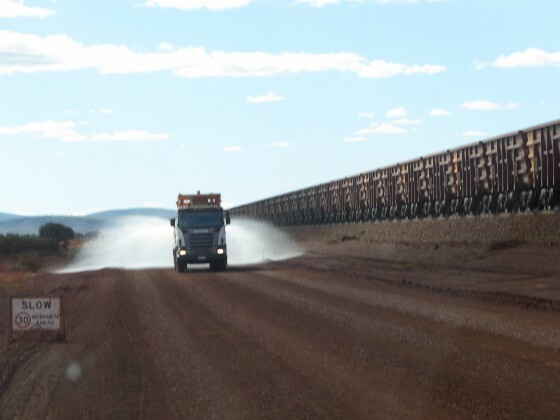 Rio Tinto owns and operates the largest private rail network in Australia and a fully loaded train weighs about 29,500 tonnes. Impressive! I was quite excited as we headed into Millstream, it had been 35 years since Brian and I had been there and to this part of the State. Millstream proved to be much more beautiful and serene than I remembered. The water lilies were spectacular and the place was just tranquil with the clear water trickling or flowing down throughout the many springs. There was still some evidence of storm damage remaining and these walk areas have been closed to the public. The road from Millstream to Python Pool was by far the most scenic drive of the whole trek. I can’t begin to describe the wildflowers along the way. 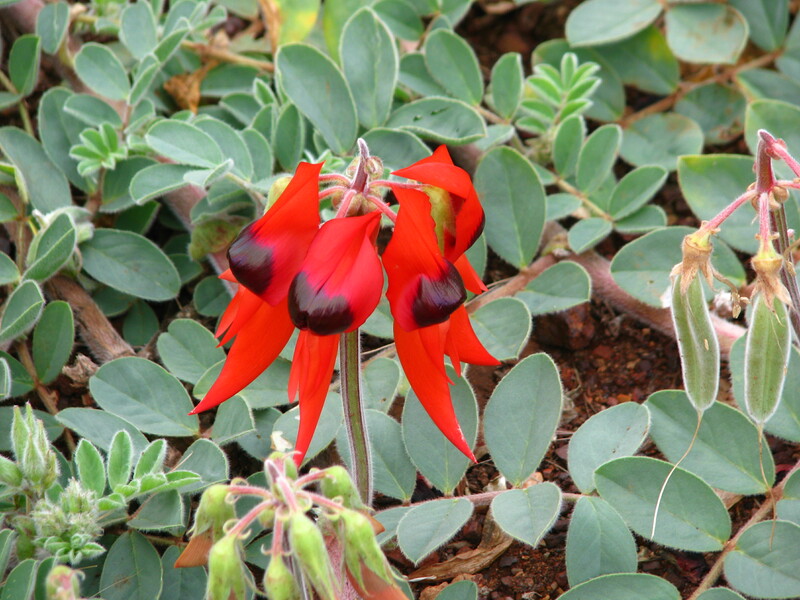 The deep red of the Desert Sturt Peas just lined the roadside and they were growing upwards, standing high on 50cm stalks! Plants were bursting with colour as we travelled along this breathtaking drive, taking us high above the plains ofChichesterNational Parkand overlooking the magnificent views of Pyramid Station. Another 2 weeks and the wildflowers would have been in full bloom and even more amazing. The drive meandered around hillsides, up and down, and there were many places to stop and enjoy the views; All the way to Python Pool, a quiet, almost eerie place to visit in the late afternoon shadows, but another excuse for a great photo shot. We camped on the verges of Pyramid Station that night and were fortunate enough to meet and have a few laughs, and a great yarn, to a true Aussie character and his Kiwi jackaroos! 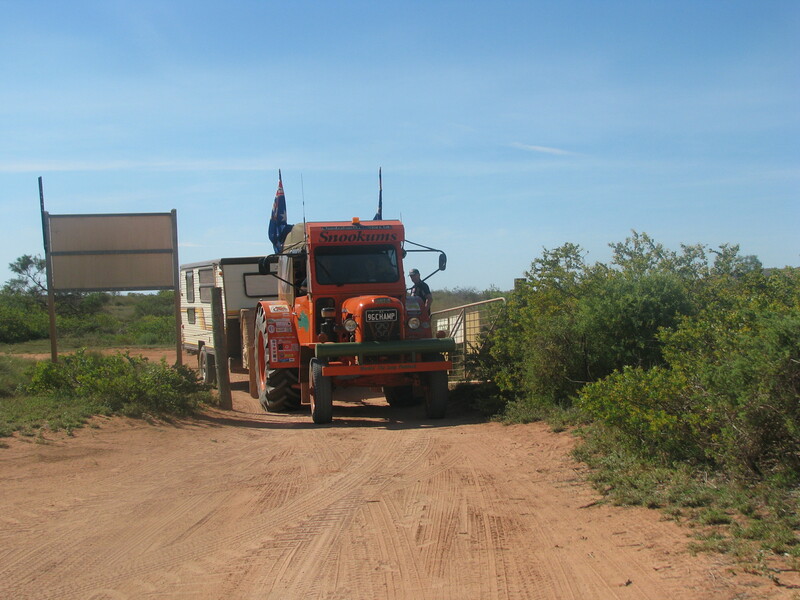 It wasn’t far into Roebourne, Point Samson and finally Cossack the next morning. Cossack was once a port to theNorth West’s first pearling industry, and is a great place to visit with its beautifully restored heritage buildings, and we were there on the day to enjoy their “Arts Awards Festival”. I have to say, it was quite an eye opener heading into Karratha. We were all in disbelief with the amount of traffic on the road. Now this is a future City in the making. Accommodation is at a peak here so planning ahead is a must. 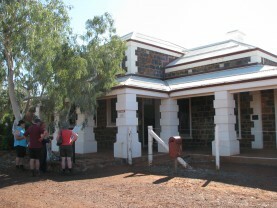 Karratha was a well deserved break and we took the first opportunity to catch up on doing the laundry. We were fortunate enough to be given a guided tour of the Rio Tinto lab and wharf facilities at Dampier and while we were there managed to stop and visit the now famous “Red Dog” statue leading into town. 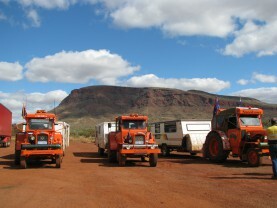 You can also see the loading facilities for the Dampier Salt Mines from the road. 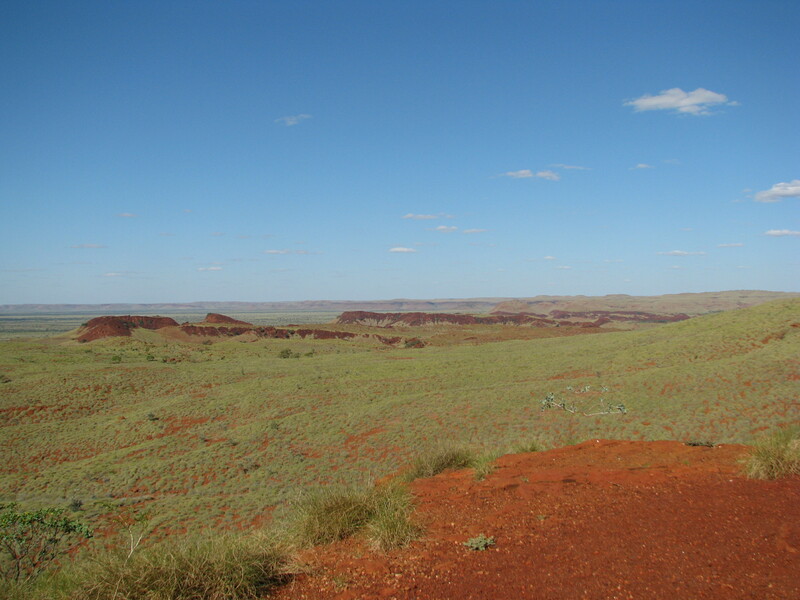 If you are in the area, you must go out to theBurrupPeninsulaand visit the North West Shelf Venture Visitor Centre, overlooking the Karratha Gas Plant. Everything you ever wanted to know about the Woodside Natural Gas facilities are on display, or explained on the short video in the theatre room. We had a pleasant meal at one of the mining villages and a brief insight into the living conditions of the fly-in, fly-out workers of this mining phenomenon. It was time to leave and continue on our way, but a funny thing happened on theNorth West Highway. Max managed to stop the Tip Top Tool man and it was quite a strange and funny sight to see our three guys buying bits and pieces in the back of the large van on the side of the road. Trevor still can’t stop laughing; he thought it was a bread van at first. We travelled onward to Onslow passing through Peedamullah Station. You can seeAshmoreIslandfrom the lookout and we could count about 11 oil rigs out to sea. We drove to the Solar Salt Fields and viewed the loading facilities from the lookout. A couple of us took advantage of the seafood industry and purchased some freshly frozen tiger prawns, to be enjoyed at a later date. 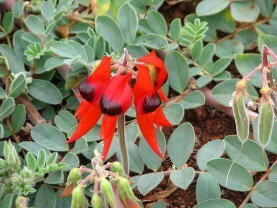 Our next point of call was Bullara Station. This is truly a stopover worth experiencing. This place has all the authenticity of station life, including a large shower en-suite under the water tank and farm animals (horses, ponies, goats and sheep) roaming freely around the camp areas. The owners have done a great job in creating a very peaceful and friendly stay. 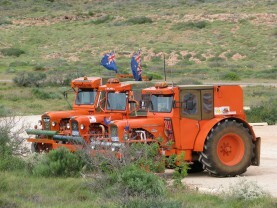 The tractors always manage to attract attention wherever they go and here was no exception. We were approached by a freelance journalist and were subsequently interviewed and photographed, for a possible inclusion in a future issue of Caravan World Magazine. We left Bullara Station and headed north, for the final time, towards Exmouth. We encountered Charles Knife Gorge on the way, where we unhooked the caravans (a mandatory requirement) and made the long, steep drive up and then down into the gorge. The panoramic views of the Gulf and Exmouth from the lookouts along the way were well worth the visit. We stopped at the Exmouth Visitor’s Centre and grabbed some grocery items in town, before heading out to the caravan park, the last opportunity to get our washing up to date. 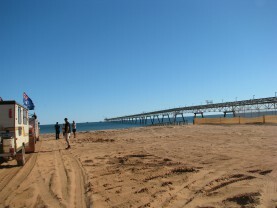 The following morning we set off in a glass bottom boat for a tour of the Ningaloo Reef. It was a little overcast that day and started to rain on the way back, but the view of the reef and the colourful marine life was amazing. We weren’t fortunate enough to see any whale sharks, but we can definitely recommend you do at least one boat cruise of the Ningaloo Reef, if you are ever travelling to the Gulf regions. 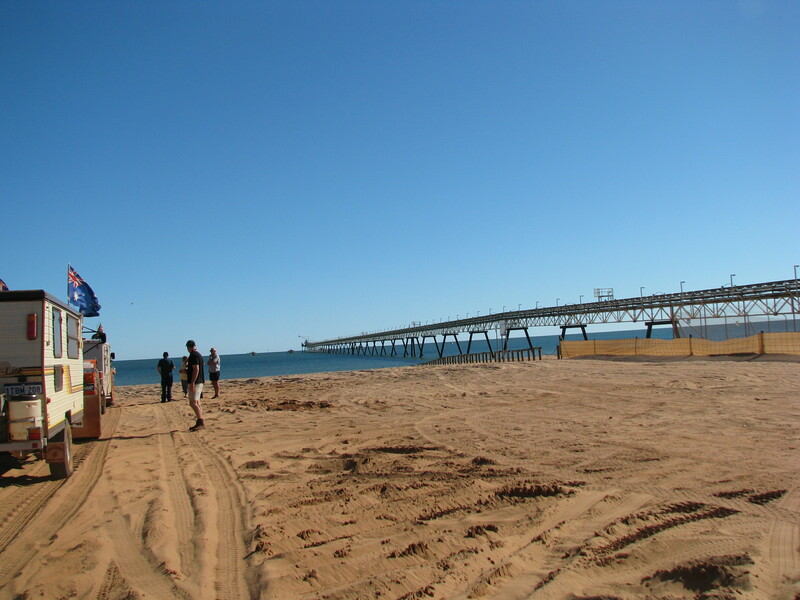 There is a lot to see along the coastline and we visited the Turtle Sanctuary, Vlamingh Head Lighthouse, where we sighted some whales off the coast, and the Mildura Wreck site. Once back at the caravan park, the local newspaper reporter had everyone looking on, as we found ourselves being interviewed once again and the tractors were put on full display at the front of the Park for more photo opportunities. As we travelled down theCapeRangeNational ParkandNingalooMarineParkroad, the beaches were beautiful to see and perfect for those who love to snorkel in the crystal clear waters. We called into the well displayed Milyering Visitor Centre and popped intoTurquoiseBay, but the highlight of the day was the Yardie Creek crossing. 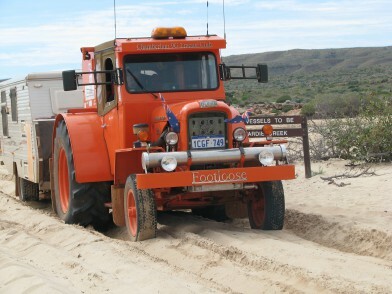 The men were in their glory as they put the tractors through their paces and tackled the mostly deep, soft sands of Yardie Creek. With tyres deflated and some good driving skills, the tractors made it through without too much trouble, not bad considering they had our well stocked caravans in tow. That was just the beginning of what was to be a long and slow-paced afternoon. 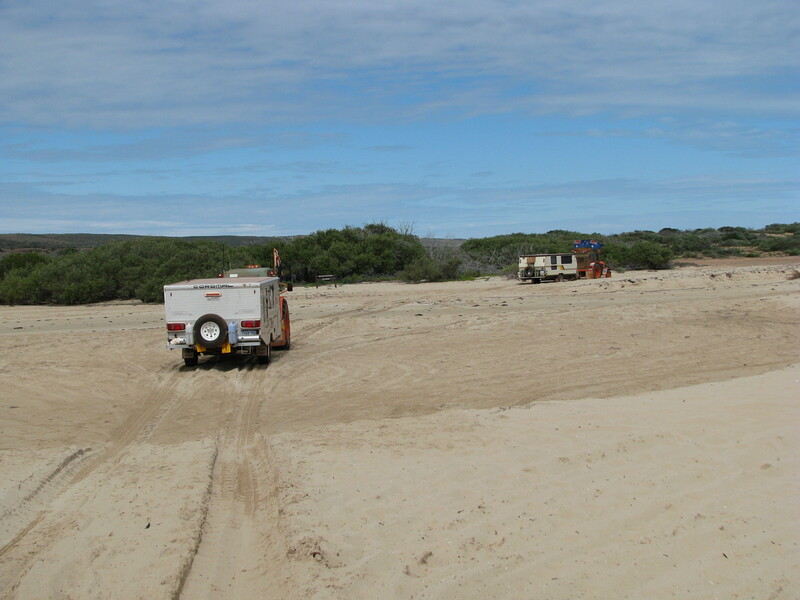 The 4wd track from Yardie Creek to Ningaloo Station proved challenging; It was slow going all the way, narrow in most parts, winding, corrugated and unbelievably rough! There was still a small amount of water around which made some parts of the track quite muddy. We’re glad we took the challenge and came out unscathed. Needless to say though, by the time we reached Ningaloo Station, we’d had enough of the rough track and decided to take the good road out to the Highway. Well, so much for a better road, it was definitely wider, but the corrugations were just as bad and it was a great sigh of relief when we emerged at the other end. It was an exciting, thrilling and tiring day. CoralBayproved a welcome sight and we couldn’t resist the local bakery for morning tea the next day. There is still evidence of major flooding and repairs taking place in and around Carnarvon. Most of the plantations are still in the process of recovery, but we purchased a few vegetables, along with some famous chocolate coated bananas, from a small farm outlet in the area. Another surprising highlight was our venture via the outback roads, including the Old Stock Route Road, through theChapmanValley. It was lush and green and the crops looked great, except for some signs of crop flooding in the lower regions. We pushed on, just making it into Nabawa in the late afternoon, and only a couple of hours before a wild storm hit the town. 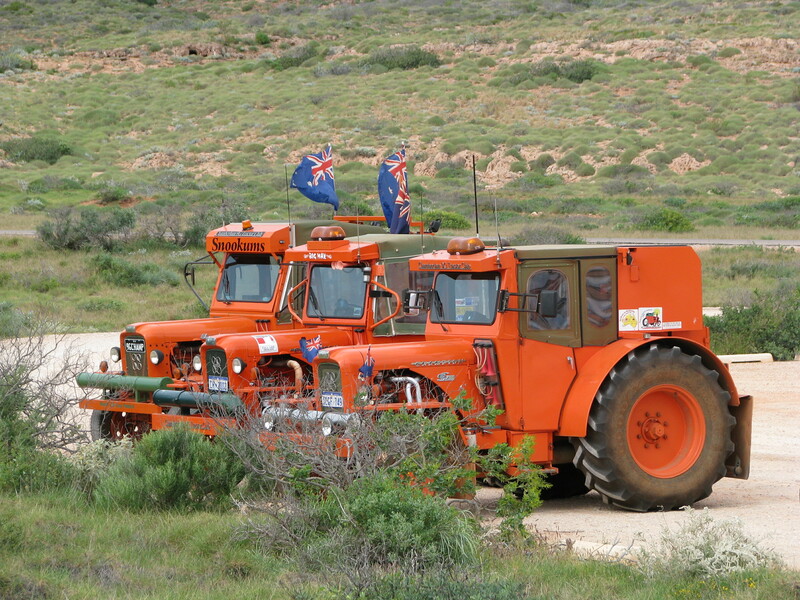 Whilst travelling through Geraldton, the local ABC radio station wanted to do an interview with us the following day, so the next morning, about 20kms north of Lancelin, Max did a phone interview and a great job recounting our tractor journey so far. We called in on Peter Nunn, a past member of the Club, at his factory in Dongara and then continued on toJurienBay, where we said our goodbyes and left Sandra and Trevor behind. From there we drove along the newCoastal Highwaythrough to Lancelin, and then made our way on the inland roads through to Wannamal and home. It takes a lot of forward planning and preparation to have a safe and trouble-free trek and this was no exception. The tractors and caravans performed well and we had no major problems. A great trip and fun time was had by all. The special times will be remembered!